Data for all 1999 hospitalizations from six states (Florida, Massachusetts, New Jersey, New York, Virginia, and Washington) were merged with US Census data, Centers for Disease Control vital statistics and National Cancer Institute, Surveillance, Epidemiology, and End Results initiative cancer prevalence data. Malignant neoplasms were identified by International Classification of Disease (ninth revision, clinical modification) (ICD-9-CM) codes (140–208), and infection and acute organ failure were identified from ICD-9-CM codes following Angus and colleagues. Cases were identified as a function of age and were projected to national levels. There were 606,176 cancer hospitalizations identified, with severe sepsis present in 29,795 (4.9%). Projecting national estimates for the US population, cancer patients account for 126,209 severe sepsis cases annually, or 16.4 cases per 1000 people with cancer per year. The inhospital mortality for cancer patients with severe sepsis was 37.8%. Compared with the overall population, cancer patients are much more likely to be hospitalized (relative risk, 2.77; 95% confidence interval, 2.77–2.78) and to be hospitalized with severe sepsis (relative risk, 3.96; 95% confidence interval, 3.94–3.99). Overall, severe sepsis is associated with 8.5% (46,729) of all cancer deaths at a cost of $3.4 billion per year. Severe sepsis, defined as a systemic response to infection with acute organ dysfunction, is associated with significant morbidity and mortality. In the United States the incidence of severe sepsis is approximately 750,000 cases per year, and the incidence is projected to increase annually . The mortality from severe sepsis ranges from 30 to 50% depending on the population studied [2, 3]. Hospitalization due to infection is a common complication for patients living with malignancy. Immunosuppression in cancer patients, resulting from cancer therapy or due to the malignancy itself, leads to severe infection, which is a frequent cause of death in this population [4, 5]. However, there is a paucity of data regarding the epidemiology of severe sepsis in cancer patients. Angus and colleagues  showed that one in six severe sepsis patients have underlying neoplastic disease, and that these patients have a 30% higher risk of death, compared with other severe sepsis patients. This increased risk of death may be precipitated by specific opportunistic infections, through tumor production of cytokines, or by worsening organ dysfunction secondary to localized obstruction. The cancer population is very heterogeneous, with great variation in the degree of immunosuppression and long-term survival. Patients with hematologic cancers are likely to be more immunocompromised than patients with solid organ malignancy. Cancers associated with major organ systems, such as the lung or the kidney, are more likely to directly impair organ function. It is uncertain whether severe sepsis outcomes are similarly variable in the cancer population. Although the occurrence of severe sepsis in cancer patients has been described as a significant cause of death, there is no published national estimate of this problem, nor any description of the variability of severe sepsis incidence and mortality by tumor type. We therefore conducted a study of a large, nationally representative sample to determine estimates of the incidence, outcome, and associated cost of severe sepsis in adult US cancer patients. We constructed a patient database for the calendar year 1999 from six state hospital discharge databases containing all discharges from non-Federal hospitals in Florida , Massachusetts , New Jersey , New York , Virginia , and Washington . We selected these states based on their geographic representation, data quality, and availability. This database does not have any patient identifiers and is public. Informed consent was therefore not required for this study. For each case we extracted the patient's age, gender, International Classification of Diseases (ninth revision, clinical modification [ICD-9-CM]) codes for principal discharge diagnosis, secondary discharge diagnoses and procedures, hospital length of stay, diagnosis-related group, intensive-care-related accommodation days and charges, and total charges for the hospitalization and disposition at hospital discharge. We obtained national and state population data from the US Census . The six-state population in 1999 was 60,397,000, or 22% of the US population. We used institution-specific cost-to-charge ratios from the 1999 Centers for Medicare and Medicaid Services Payment Impact File (Centers for Medicare and Medicaid Services, Baltimore, MD, USA) and obtained information on cancer prevalence from the National Cancer Institute, Surveillance, Epidemiology, and End Results initiative . We selected all adult (defined as aged ≥ 20 years) nonchildbirth-related hospitalizations to match hospital discharges to the categories available for state data from the US Census Bureau. Discharges with a diagnosis-related group from major diagnostic category 14 relating to pregnancy, childbirth, and the puerperium were excluded. We identified severe sepsis cases using ICD-9-CM codes for both infection (bacterial or fungal) and acute organ dysfunction . This method was validated by Angus and colleagues in their study by comparing a validation cohort with a reference cohort. In 1999, no ICD-9-CM code was available for severe sepsis. Cancer was identified using ICD-9-CM codes for malignant neoplasms (140–208), and was further categorized into hematologic primary or solid tumor primary. In order for a malignancy ICD-9-CM code to be used for a discharge diagnosis, the patient had to have current malignancy. National Cancer Institute, Surveillance, Epidemiology, and End Results initiative reporting categories were matched to specific sets of ICD-9-CM codes to carry out tumor type-specific analyses. The hospital length of stay was extracted from the database and defined as the mean with standard deviation. The presence of noncancer comorbidity was identified by a Charlson-Deyo score > 0  after excluding cancer categories. We defined cases as postoperative if they were assigned to a surgical diagnosis-related group. We estimated costs by multiplying reported charges by the hospital-specific cost-to-charge ratios. This method of using provider-specific files from the US Health Care Financing Administration has been previously described . Hospital mortality and discharge to home were identified from hospital discharge status. We projected hospitalizations, resource use, and outcomes to national levels using age-specific/gender-specific weights . Total prevalence and tumor type-specific prevalence as a function of age for persons living with cancer were estimated by applying 1997 prevalence rates from the National Cancer Institute, Surveillance, Epidemiology, and End Results initiative to the 1999 US population. Severe sepsis incidence was calculated by dividing the national estimate for the number of severe sepsis hospitalizations by the estimated population in thousands. We compared continuous data using an unpaired Student's t test and compared categorical data by the chi-square test or Fisher's exact test. We constructed the databases in Foxpro®  (Microsoft® Corporation, Redmond, WA, USA), and conducted analyses in Data Desk® (Data Description Inc., Ithaca, NY, USA) and in SAS® (SAS Institute Inc., Cary, NC, USA). Of the 6,754,638 hospitalizations in patients aged 20 years and older in the six-state database, 606,176 (9.0%) were associated with a cancer diagnosis. A total of 220,385 (3.5%) hospitalizations were associated with severe sepsis, and 29,795 (13.5%) of these severe sepsis hospitalizations had cancer. Severe sepsis was involved in 4.9% of all cancer hospitalizations with a higher rate among medical hospitalizations (5.5%) than surgical hospitalizations (3.8%). Descriptive characteristics for this cohort are presented in Table 1; all differences between means and proportions are significant (P ≤ 0.0001). The cohort of cancer patients with severe sepsis was slightly older (68.2 years versus 66.2 years, respectively), had a higher proportion of males (55.6% versus 49.9%, respectively), and had a higher proportion of patients with noncancer comorbid conditions (31.8% versus 28.5%, respectively) than those patients without severe sepsis. Cancer patients with severe sepsis were less likely to be surgically managed (31.1% versus 40.8%, respectively) and were more likely to receive intensive care unit (ICU) care (47.9% versus 14.8%, respectively) than other hospitalized cancer patients. In cancer patients hospitalized with severe sepsis, 37.9% were discharged directly to home and 24.3% were discharged to another hospital or nursing home. All differences between means and proportions are significant (P ≤ 0.0001). Adults defined as aged ≥ 20 years; childbirth-related discharges not included. aCaucasian results were calculated with data from four states (Florida, New York, New Jersey, and Massachusetts). bIntensive care unit results included hospitalizations for only five states (Florida, New York, New Jersey, Massachusetts, and Washington). After adjusting for age and gender, the cancer population is much more likely to be hospitalized (relative risk, 2.77; 95% confidence interval [CI], 2.77–2.78) and to be hospitalized with severe sepsis (relative risk, 3.96; 95% CI, 3.94–3.99) than the noncancer population (Table 2). This produced a national estimate of 2,532,000 hospitalizations and 126,200 cases of severe sepsis in the cancer population each year. 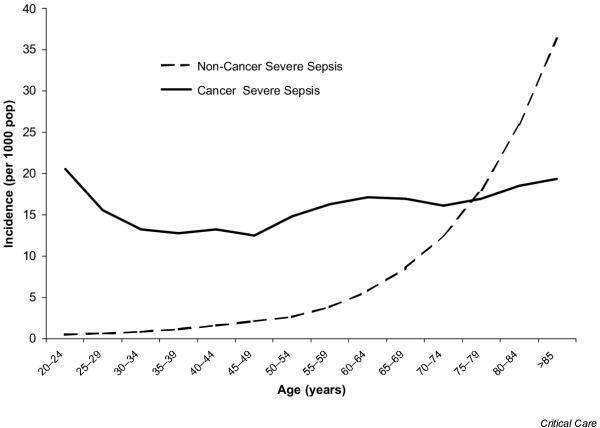 The age-specific cumulative incidence of severe sepsis for those with and without cancer is presented in Figure 1. While the incidence of severe sepsis in the noncancer population increased exponentially from 0.77 per 1000 for ages 20–39 years to 36.6 per 1000 for those aged 85 years and older, the incidence in the cancer population was almost independent of age with an overall rate of 16.4 cases per 1000 cancer population. aAdults defined as aged > 20 years. bAfter adjusting for age and gender, cancer patients are much more likely to be hospitalized (relative risk, 2.77; 95% confidence interval, 2.773–2.779) and to be hospitalized with severe sepsis (relative risk, 3.96; 95% confidence interval, 3.94–3.99). cSevere sepsis cases per 1000 population. dRelative risk of severe sepsis between tumor type and noncancer population (excluding childbirth). eChildbirth-related discharges not included. The overall hospital mortality for severe sepsis patients with cancer was 52% higher than for noncancer severe sepsis patients (37.8% versus 24.9%, respectively) and was five times greater than the nonsevere sepsis cancer hospital mortality (37.8 % versus 7.2%, respectively). This corresponds to a national estimate of 46,729 hospitalized severe sepsis deaths per year in the cancer population. The age-specific hospital mortality for those with and without cancer is presented in Figure 2. Mortality for cancer patients with severe sepsis increased from 25% in those aged 20–24 years to 40% for those 40–44 years of age, at which point it became independent of age with an average rate of 38% for those aged 40 years and older. In contrast, the noncancer severe sepsis mortality rate increased continuously from 9% in those aged 20–24 years to 34% in those aged 85 years and older. A single primary tumor type was found for 83.4% of severe sepsis cancer hospitalizations (54.7% with solid tumors and 28.7% with hematologic tumors), multiple primary tumors were present in 4.3% of cases, and metastatic cancer without reference to the primary accounted for 12.3% of cancer severe sepsis discharges. Cancer prevalence, hospitalizations, severe sepsis incidence, and severe sepsis mortality for selected tumor types are presented in Table 2. The selected set of hematologic cancers accounted for 98% of all hematologic cancer hospitalizations and the selected solid tumors accounted for 75% of solid tumor hospitalizations. The incidence of severe sepsis was much higher in hematologic cancers than in solid tumors (66.4/1000 versus 7.6/1000, respectively;P = 0.006) but both cancer types had similar hospital mortality rates (36.1% versus 37.2%, respectively). While the risk of severe sepsis was 1.8 times higher for solid tumor cancers than for the noncancer population (relative risk, 1.81; 95% CI, 1.79–1.82), the risk of severe sepsis was 15 times greater for hematologic cancers (relative risk, 15.71; 95% CI, 15.55–15.88). Among patients hospitalized with hematologic tumors, non-Hodgkin's lymphoma was the most frequent tumor type, with 159,984 hospitalizations and 11,729 cases of severe sepsis. The cumulative incidence of severe sepsis was 43 cases per 1000 people living with non-Hodgkin's lymphoma. The relative risk of severe sepsis in those with non-Hodgkin's lymphoma was 10 times greater than that observed in the noncancer population (relative risk, 10.26; 95% CI, 10.08–10.44). The highest severe sepsis rate occurred in myeloid leukemia with more than one in four persons affected (275.5/1000), yielding a relative risk of 65.2 (95% CI, 63.95–66.36) compared with the noncancer population. The lowest rate, Hodgkin's disease (17.2/1000), was still more than four times that of the noncancer population. The highest mortality occurred with monocytic leukemia (45.8%), but with only 110 cases this group also had the smallest number of deaths. There was much more variation between solid tumor locations. Cancer of the lung and bronchus had the highest severe sepsis incidence (58.2/1000), the most cases (20,377), the highest mortality (45.2%), and a much higher risk of severe sepsis than the noncancer population (relative risk, 13.8; 95% CI, 13.58–13.95). Breast cancer, prostate cancer, and colon cancer represented about one-half of all solid tumor hospitalizations; however, the severe sepsis incidence for each of these tumor types was lower (1.6 per 1000, 4.8 per 1000, and 9.8 per 1000, respectively) than for many other tumor types. Four solid tumor types had rates lower than the noncancer severe sepsis rate: corpus and uterus tumors, breast tumors, thyroid tumors, and skin melanomas. Solid tumors had a wider range in mortality than hematological tumors (27.1–45.2%), all of which were higher than the noncancer mortality rate. The severe sepsis cancer length of stay was almost three times as long as (17.1 days versus 6.7 days, P < 0.0001) and the costs were more than three times as much as ($27,400 versus $8700, P < 0.0001) nonsevere sepsis cancer hospitalizations (Table 3). Medical cancer severe sepsis hospitalizations stayed almost twice as long as (12.5 days versus 6.5 days, P < 0.0001) and cost more than twice as much as ($18,200 versus $7100, P < 0.0001) other medical cancer hospitalizations. Surgical cancer severe sepsis discharges stayed almost four times as many days as (27.1 days versus 7.0 days, P < 0.0001) and cost more than four times as much as ($48,400 versus $10,900, P < 0.0001) other surgical cancer hospitalizations. Surgically managed cancer severe sepsis patients stayed longer than (27.1 days versus 12.5 days, P < 0.0001) and cost more than ($48,000 versus $18,200, P < 0.0001) cancer severe sepsis medical patients. Values presented as mean ± standard deviation; all differences between means are significant (P < 0.0001). Adults defined as aged ≥ 20 years; childbirth-related hospitalizations not included. The estimated total national hospitalization cost associated with the care of cancer severe sepsis hospitalizations in 1999 was $3.4 billion. Severe sepsis cancer hospitalizations accounted for 4.9% of cancer hospitalizations, but consumed 14.0% of the costs. The cost of care for adults aged 20–49 years, aged 50–64 years, and aged 65 years and older were $584 million (17.1%), $918 million (26.9%), and $1913 million (56.0%), respectively. In the present investigation we have shown that severe sepsis is a common complication in cancer patients, with an estimated 16.4 cases per 1000 persons living with cancer. The rate of severe sepsis in cancer patients was observed to be three to five times higher than that in noncancer patients, depending on the age cohort. Importantly, the risk of severe sepsis in cancer patients was not as age dependent as that in those patients without cancer. The average hospital mortality for cancer patients with severe sepsis was 37.8%, with a national estimate of 46,729 annual deaths, which represents nearly 10% of annual cancer deaths. There was significant variability of the incidence and mortality of severe sepsis by specific tumor type, with hematologic malignancies having the highest incidence and mortality. In addition, cancer patients with severe sepsis had significantly longer lengths of stay and associated hospital costs than hospitalized cancer patients without severe sepsis. Cancer patients may be immunocompromised due to multiple factors such as chemotherapy, radiotherapy, impairment of normal leukocyte function, or use of corticosteroids . Although infectious complications in cancer patients have been well described , estimates of the true incidence of severe sepsis in this population have been unavailable. To our knowledge, this is the first published study to create national estimates of severe sepsis incidence and mortality in cancer patients. We have estimated that approximately 2.5 million annual hospitalizations occur for patients with a primary or secondary diagnosis of cancer. Severe sepsis is estimated to occur in 4.9% of these patients annually. Compared with the overall population, cancer patients were nearly three times more likely to be hospitalized with severe sepsis. The incidence of severe sepsis in the noncancer population dramatically increased with increasing age. 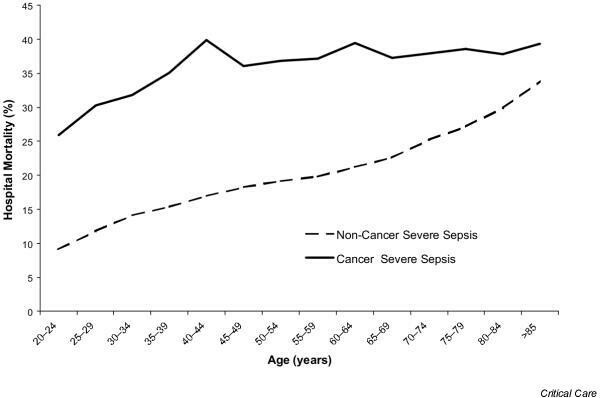 In contrast, age had little effect on the incidence of severe sepsis in cancer patients. In part, this may be due to younger patients receiving more aggressive chemotherapy than older patients, potentially balancing the increased risk of infection attributable to increasing age. Importantly, this study has demonstrated the high mortality of severe sepsis in cancer patients. The national estimate of 46,729 annual deaths from severe sepsis represents nearly 10% of all cancer deaths. This is probably an underestimation since many cancer patients die at home under hospice care [18, 19]. Similar to the incidence of severe sepsis, severe sepsis mortality increases significantly in noncancer patients with increasing age. However, the mortality of severe sepsis in cancer patients is less affected by age. Even younger adults have inhospital mortality rates as high as 35%. Many of these younger patients may have potentially curable malignancy only to die from severe sepsis, with great societal cost. One of our working hypotheses for the present study was that the incidence of severe sepsis would vary greatly between tumor types. We hypothesized that patients with hematologic malignancy would have a high incidence of severe sepsis, associated with high mortality. Multiple studies have demonstrated the high mortality of severe infection in such patients [20, 21]. We also hypothesized that lung cancer patients would be at high risk for complicated pneumonia and subsequent severe sepsis due to tumor obstruction of major airways . Indeed, we have demonstrated that the incidence and mortality of severe sepsis varies by tumor type and specific cancer. The incidence of severe sepsis was significantly higher in hematologic malignancies (66.4 per 1000) than in solid tumors (7.6 per 1000). While the risk of severe sepsis was 1.8 times higher for solid tumor cancers than for the noncancer population, the risk of severe sepsis was 15 times greater for patients with hematologic malignancy than for the overall population. This result is not unexpected given the higher severity of chemotherapy-induced myelosuppression, including bone marrow transplantation, in patients with hematologic malignancy. We have demonstrated that the incidence of severe sepsis in patients with lung cancer is nearly 14 times higher than in the noncancer population (relative risk, 13.76; 95% CI, 13.58–13.95). Also, lung cancer patients had the highest inhospital mortality from severe sepsis of all the solid tumor types. This result is not surprising given the persistent high mortality from this deadly malignancy. Interestingly, inhospital severe sepsis mortality was similar for hematologic cancers and for solid tumor cancers (36.1% versus 37.2%, respectively). Many studies have demonstrated the significant burdens of cancer care in terms of healthcare expenditures and resource use [23, 24]. Brown and colleagues reported that, in 1990, hospitalization costs for cancer patients were $17 billion . Angus and colleagues also published hospitalization costs for severe sepsis patients of an estimated $17 billion annually . Since 17% of this patient population had malignancy, this translates into an estimated annual hospitalization cost for cancer patients with severe sepsis of $2.8 billion. In the present study, we have estimated the total hospitalization costs for cancer patients to be $3.4 billion annually. Much of this high cost is due to prolonged ICU and or hospital length of stay, which has been well described in the cancer population [25, 26]. This may contribute to bias against aggressive care for these patients who become critically ill [27–29]. Interestingly, in the present study approximately 50% of cancer severe sepsis patients were admitted to an ICU. Potentially, advanced directives that limited transfer to an ICU were partly responsible for this observation. In the present study, we have shown that cancer patients with severe sepsis have a nearly threefold higher length of stay and total cost than hospitalized cancer patients without severe sepsis. We were not able to determine whether this increased length of stay was solely due to the diagnosis of severe sepsis from our database. In addition, surgical cancer patients with severe sepsis have a total cost and length of stay that is more than double that of medical cancer patients with severe sepsis. This is understandable since surgical oncology operations are often complex and can be associated with significant complications [30, 31]. There are important limitations of the present study that deserve comment. Specifically, since a national hospitalization database does not exist, our national estimates for severe sepsis in cancer patients were generated from a hospital database from six large states. However, these six states represent the most populated regions of the United States and thus should provide a reliable estimate for this very serious cancer complication. In addition, similar to a previous severe sepsis epidemiologic study, we used multiple ICD-9-CM codes to determine the presence of severe sepsis . There may thus be an element of underestimation or overestimation of severe sepsis in the present study. Using administration data retrospectively to define severe sepsis and cancer may be prone to bias, such as the interpretation of hospital records by coders not involved in patient care. A new ICD-9-CM code was recently approved specifically for severe sepsis, which should increase the ability to accurately identify these patients for future studies of severe sepsis. Future studies could also include data from severe sepsis registries to study this special population prospectively. Hospitalizations of cancer patients were captured in our analysis, yet this may not represent the accurate number of total patients affected, since some patients may have had multiple hospitalizations within a year. We believe that one strength of the present study is the extensive incidence and mortality data by tumor type. However, the incidence of severe sepsis in patients with hematologic malignancy is likely to be overestimated, since one of the criteria for acute organ dysfunction due to sepsis includes the ICD-9-CM codes for thrombocytopenia. These patients frequently receive myeloablative chemotherapy and possibly could have an infection without any acute organ dysfunction, but still would be captured as having severe sepsis since they have acute thrombocytopenia. Finally, we believe that the resource-use data, including length of stay and total hospital cost, is an important contribution. We were unable to assess whether the patient had multiple ICU admissions, and the hospital cost analysis is limited to all-cause cost and is not severe sepsis specific. However, the demonstration of the extensive resources required for the care of these patients emphasizes the need for preventative care to limit immunocompromised infections and the need for advances in sepsis therapy. We found that severe sepsis is a common, deadly, and costly complication in cancer patients. The incidence of severe sepsis in this population occurs across all ages and is associated with high mortality. Cancer patients with severe sepsis have significantly longer hospital lengths of stay and total hospital costs. We estimate that the annual hospital costs for these patients exceed $3 billion annually. Advances in medical therapy for these complicated patients could have a significant impact for cancer survival. Severe sepsis is a common complication in cancer patients with an estimated 16.4 cases per 1000 persons living with cancer. The incidence of severe sepsis was nearly four times higher in cancer versus non-cancer patients. Severe sepsis accounted for nearly 10% of all cancer deaths. Severe sepsis incidence and mortality varied widely among tumor types. The length of stay and hospital costs for cancer patients with severe sepsis was nearly three times that of cancer patients without severe sepsis. MDW, LB, LMC, JJ & RLQ are employees of Eli Lilly & Company.